The Capercaillie is our largest lodge sleeping up to 10 in 5 beautiful bedrooms, some with dressing areas and all with SuperKing size beds. Large outdoor hot tub, BBQ hut with indoor charcoal bbq. Perfect place for celebrations. Just returned from an amazing break in the Capercaillie. The house is fantastic - supplied with everything you would ever need and more. The setting is just beautiful and walking through the countryside with only the livestock around was perfect. This is what we all needed - lots of r&r, with the hot tub being a perfect middle and finish to each day. Our dogs enjoyed it too, they have come back home exhausted with all the walking we all did. Just perfect. What an amazing house! The views are lovely, house got everything you could possibly need, hot tub is brilliant and loved the tranquility of the area. It was great to be able to feed the friendly animals too. A fantastic time was had by all of us! Thank you. We had a fantastic weekend as a group of 10 staying in the Capercaillie. The accommodation was excellent, hot tub was fab and the local walks were great. All in all, one of our best weekends. My kids selected a shortlist of 3 possible places for us to all get together for my 60th birthday. We were a party of 6 adults and 1 child (2). Capercaillie scored highest against all our criteria and we set off on 4 January 2019. Forty minutes from Edinburgh in a perfect setting, the house faces the hills. The open skies; the silence; the tranquillity welcomed us. Then we stepped into the house. Wow! Glass; light; views; space (open and private); modern appliances but not overwhelming; calm and uncluttered; plenty of showers, baths, loos; everything you could need - including a pasta machine. And a high chair and cot. A peek out the front and the hot tub beckoned. This is emptied between guests and the chemicals are checked every day. Perfect temperature and the wee one loved it. We always had at least 2 people with him and he never stayed in for more than 15 minutes thanks to the Houghton's helpful advice. Plastic glasses provided so we could raise a toast AND fresh cotton gowns, slippers and towels all provided. A peek out the side revealed the BBQ hut. A place of sanctuary with a BBQ shielded from the elements and seating. All tools provided as well as charcoal and lighting materials. We had BBQ both nights. Steak on night one and lobster on night 2. Perfect. The breakfast provided by AirHouses was awesome: fresh butter; sausages; bacon; haggis; their own eggs - oh my! The beds were so comfortable and the bedding was clean, cotton and fresh. The bathrooms were sumptuous and gorgeous bodywash and shampoo were provided. The house was warm with underfloor heating and the parking was close to the door. When we took in our surroundings we found close to home a wee honesty shop stocked with local goodies and essentials. Most of the food was Gluten free. There was a playhut with good quality toys, books and puzzles which can be borrowed and taken back to base. Big hit was the child sized gravel pit complete with bulldozers and diggers to play in. Adults enjoyed this too...There were lovely walks and amazing animals: alpacas; a lama; Shetland ponies; chickens; pigs; Aberdeen Angus cows and Belted Galloways (Google it); frothy permed sheep and a cat. There was also an amazing selection of tractors and machinery which Mr Houghton patiently shared with us. We spent our whole stay on the farm and we all agreed it was one of our best ever breaks. We had space and privacy; the Houghtons are fantastic hosts - always there if you need anything but never obtrusive; my birthday was so happy and 2019 was launched! We had an amazing time staying at the Capercaillle for NY this year. We were 5 adults, 2 children and 2 dogs, and initial lay we thought 6 days in the middle of nowhere would be a bit long. How wrong we were. The hot tub, surrounding animals, walks and ‘honesty shop’ all added to the amazing time had by all. The house was very spacious, and exceeded all our expectations. We loved our stay at the capercaillie for our friends visiting from Australia. The hot tub is massive and can fit everyone in which is a bonus. The rooms are beautiful and very comfortable. I would recommend this house to anyone. The only thing I would ask is for more cleaning products to help with the clean up, and possibly ashtrays for outside to ensure the property is kept tidy. Stunning house perfect chill out location. We were a party of 9 woman mixed ages celebrating a 60th birthday party. Couldnt fault the house the location or customer service everything was lovely. The owner came and gave us a brief run down on how to work the cooker etc and the hot tub settings. He explained the hot tub would be checked twice daily which it was with no invasion of our privacy. Spectacular view fro the house of surrounding countryside. And all enjoyed the use of free wifi which worked perfectly. We booked with airhouses for my hen weekend and it was so good. The house was immaculate with lots of wee very nice touches from the owners. I would only suggest one thing: to have better lighting in the bbq hut. When doing bbq at night, the fairylights are definitely not enough. Other than that, it's easy to find, very quiet and with beautiful sceneries. I would definitely go back! Had a fabulous stay, the house caters for your every need & is the height of luxury - will def return!! This was one of best holidays, amazing location, excellent host, house was perfect, but it was all the little finishing touches that made it extra special, super big hot tub, indoor BBQ, outstanding welcome basket, the little shop and all the animals. I would heavily recommend this amazing property and location, it won't disappoint. Beautiful house with a hot tub. The house has everything you need for a great holiday. The farmer was so good with the children, explaining about all the animals on the farm. The highlight for them was getting to take the ponies for a walk, on their own. We had a wonderful family stay with 6 adults and 2 infants. The house was superb with every need catered for , spacious and spotless. We used the hot tub every night to relax after days out sightseeing . Our toddlers had great fun feeding the horses ,pigs and alpacas and playing in the wee play barn - a thoughtful and well equipped provision . Excellent WIFI which coped with all our devices. The ensuite facilities added to the relaxing and practical needs of our large family sharing one home but still requiring a bit of privacy . Stunning views from all the rooms and from everywhere on the farm. A great location for exploring the Borders with easy accesability to the pretty market towns and the seaside. The family would not hesitate to return and hopefully we will. We would highly recommend this large house for a family get together or celebration. 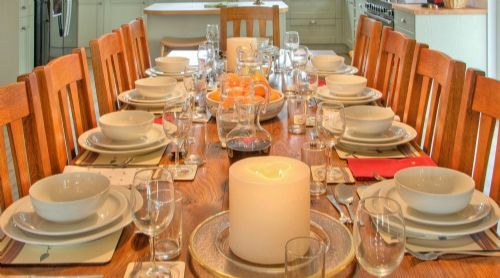 Foodies will not be disappointed with the quality of food and local produce which is available in this part of the country, Arrangements can also be made to have someone come to the house to cook for you - we did not take up this offer but can see the benefit for a special occasion. The owners have begun to set up a small shop which will be helpful if necessities are forgotten - nappies , milk and bread were stocked for example. We enjoyed a delicious breakfast pack of high quality local foods which was included in the price, in addition we purchased some locally reared barbecue meats and utilised the Finnish style BBQ hut - another excellent provision which would allow the fun of barbequeing regardless of the weather. Altogether we had a lovely stay and would not hesitate to recommend. Thank you so much for your lovely and detailed review. It is much appreciated and we are delighted you enjoyed The Capercaillie. The animals are always very popular but not only with children! Again many thanks and we do hope to see you back at Airhouses at some time in the future. It was the perfect location for our special day. Rural, discreet, John Lewis quality everywhere, with 5* comfort. Having stayed at airhouses previously on holiday, I knew it would be the perfect rural setting for our modest family wedding, the garden area of the Capercaillie made for a great seating area with small ailsle and we were married in front of all the Shetland ponies. Hot tubs and all mod cons and fully equipped kitchen made a special day and even better weekend. It was superb! Thank you so much for your lovely review and we are delighted it was a successful wedding venue for you. We wish you both the very best for your future and we do hope to see you again at Airhouses. Many thanks indeed. Thank you so much for your lovely review. We are glad your Special Birthday was enjoyed at Airhouses and we hope to welcome you back at some time in the future. Many thanks indeed. 4 wonderful nights spentry in the fabulous tranquil setting. The house is spotlessly clean with every comfort you could wish for. The host's are lovely & friendly, always discret but available if you need them...which we didn't as everything is fully explained on arrival. The various animals around the land were so friendly especially the pigs. Walks from the house were great too if you love a nice long walk. Just can't find fault and will definitely be returning. Thank you so very much for your lovely review and for taking the time to write a review. It is very much appreciated and we are delighted you enjoyed your stay. We do hope to welcome you back soon. Again, many thanks. Another fabulous four days spent at Caipercaillie ! Everything has been thought of to make your stay very comfortable ! Lovely extra touch this year of a bag of goodies ! Would highly recommend a stay here, whether it be to chill out in the hot tub ,or to go for walks ! Already planning a visit for next April ! Thanks again Carol & Martin ! We are delighted you enjoyed your third visit to Airhouses and it was lovely to see you all again. Many thanks for taking the time to write such a lovely review. A wonderful stay in a beautiful venue. We absolutely loved our stay at the Airhouses. The lodge was beautifully finished, had everything we needed and had plenty of space for our party to comfortabably enjoy our stay. The surrounding land provides lovely walks to enjoy the views. Thank you very much for a wonderful weekend. Thank you so much for your lovely review. We are really glad you enjoyed your stay and we hope you will come back to visit us again. Many thanks indeed. 10 of us stayed for a long weekend having stayed 3 years ago and loved it so much we decided to return. The house is beautiful and has everything you could ever think of. It’s also bliss having a hot tub that actually fits 10 people comfortably! Unfortunately due to the time of year we went, the snow was really heavy and we weren’t sure we’d make it but Martin went above and beyond and collected us all from a nearby hotel and drove us to the house - none of cars would have made it as it was a complete white out! We felt extremely well looked after by Martin and Carol and will definitely be back (but perhaps not in the winter!!). Perfect weekend! with what awaits you: stunning views, perfect peace and quiet and a level of comfort second to none. We had a wonderful short stay and will most certainly be returning next year. We loved the hot tub, BBQ hut and beautiful surroundings. We also appreciated the thought and care the owners put into ensuring our stay was 5 star. A huge thanks for making this such a memorable stay. We were a party of 10 women celebrating me reaching 60. Fantastic weekend, accommodation to a very high standard and absolutely immaculate. Very well equipped, you have thought of everything. Hot tub was a perfect size for us and very well used!! Twenty months since our first visit, the property was just as immaculate as the first visit. Every aspect of comfort is thought of even dressing gown and slippers for going into the hot tub which is very well maintained, water quality checked regularly during our stay. There is no shortage of cutlery, crockery and glassware. Well heated and plenty of hot water. The property is very spacious the whole family enjoyed their visit. Had the most amazing hen weekend, couldn't fault a thing most homely and welcoming place. Can't thank them all enough would highly recommend. Everything there that you need and was welcomed with the most loveliest welcome back. Thanks Carol and Martin we will certainly be back. Thank you so much for writing a review and we are delighted that your enjoyed your stay at the Capercaillie. We hope to welcome you all back soon. Beautiful house, location, scenery. Everything in the house was very high quality. No expense spared. Breakfast pack was supplied - very nice touch. We had our wedding at this location and it was lovely. The owners Carol and Martin were always on hand if we needed anything at all. We returned home to a nice gift which was sent by Carol and Martin - what a lovely gesture! We will definitely stay again! Thank you so very much for your review and for choosing the Capercaillie to hold your wedding. We were very excited and delighted that you all had such a lovely time. We hope to see you again soon. Many thanks indeed. great venue for a team meeting! What a lovely place! great views, great facilities in the house- very comfortable and enough space for us to spread outt and very well equpped. Knew if we needed anything we could ask and someone came and helped. the breakfast pack was superb! it was a great venue for a meeting and team building. Thank you so much for your lovely review and it was very exciting to have such a great company visiting The Capercaillie. We are delighted it was a good venue for your team meeting. Again, many thanks indeed. We stayed for a week beginning of June, the lodge was outstanding everything you needed was supplied, it was spotless, the hot tub was checked twice a day to make sure chemical levels were OK. We had a problem with hot water while we were there it was sorted out straight away. The views were amazing, plenty of good walks around the property. We used Mari Brown for a dinner on the Saturday night she is a chef listed in the air house information booklet, she came to the lodge made us all dinner, the food was delicious,it was a great experience and nowhere near as expensive as you thing. We will definitely will go back to the capercaillie and will recommend air houses to friends. Thank you so much for taking the time to write such a lovely review. We are delighted you enjoyed your stay at the Capercaillie and equally delighted to hear that you may be back sometime. Again many thanks indeed. Lovely accommodation, service from owners not perfect. Loved the accommodation. Only complaint I have is that owners called and texted us telling us to keep noise down. Felt it was a bit much. Sometimes made to feel like children. They should know that people go there to have a good time and so will want to play music while in hot tub. Also had to ask them to fix boiler as no hot water which meant more visits from owners. Thank you for taking the time to write a review. I am sorry you felt it was intrusive to text you regarding the music which could be heard loudly outside. Airhouses is all about "peace and quiet" and we do ask that if you are playing music inside then to keep the patio doors closed so that it can not be heard outside. This is out of consideration for other guests, our animals and the wildlife. As we are situated on the top of a hill noise tends to travel across the valley, especially on a calm evening. A text seemed the least intrusive way to remind you of our Terms and Conditions. We are sorry about the central heating boiler, which seemed to have got itself stressed out by the exceedingly hot weather! Fortunately, there are two large immersion heaters, which just took a minute to switch on, so hot water was back on more or less straight away. This was your second visit to the Capercaillie and we do hope you will return again. We have no problem with music inside, and there are various sound systems in the house. However, we hope you can understand our reasons for not wishing to hear music outside. Again many thanks for your review and we hope you all had a safe journey home. Another lovely four days ! From lovely walks to relaxing in the hot tub , we could not have asked for more ! It was our second year and we will definitely be back next year ! 3 families stayed along with Hamish the dog for 6 nights. It was a stunning house with every need catered for. Clean, spacious with a few wow extras like the hot tub and amazing BBQ hut. Well equipped with games, videos, booksetc and the breakfast welcome pack was delicious. Owners were lovely , helpful and friendly and the setting was beautiful. We all loved the animals-cows, sheep, alpacas, llamas, Shetland ponies and fed the pigs daily, not to mention the local wildlife birds of prey, pheasants and deer. I would highly recommend this property. 5 stars. Thanks Carol and Martin for a brilliant getaway in the Borders! Thank you so much for your lovely review. We are delighted you all enjoyed your stay in the Capercaillie and I am sure the animals are missing you all, and missing being fed by you. We do hope you will visit us again soon. Many thanks indeed. Absolutely amazing stay at the house the last weekend in march 2017. Great weather helped, but the house was immaculate, the views incredible and the owners very helpful - we even got to see a new born calf! Thank you so much for taking the time to write a lovely review. We are so glad you enjoyed your stay and that you saw the very first calf for this year - a few days early! Again many thanks indeed. Stayed here for a hen weekend and could not recommend more! The bedrooms and bathrooms are all to a high standard and have everything you could need. The kitchen was well equipped and the welcome baskets with bacon, sausage, haggis eggs etc was a welcomed treat! The owners are really helpful and showed us how to use the BBQ hut and hottub. Both are a must use and just make the house extra special especially having Prosecco in the hottub! Animals eat from you are are really friendly. Lovely to wake up to. We went to the Black Bull for dinner and got a mini bus which was only £8pp return. Beautiful stay and a must for a couples retreat or girls night away! Thank you for your great review. We are delighted you enjoyed your hen weekend and hope you will maybe make it a regular occurrence. Again, many thanks indeed. Thank you so much for your positive review. We are delighted you enjoyed your stay at the Capercaillie. My housekeepers were also delighted with your comments about the cleanliness. We have a great team and it is good they are appreciated. We do hope you will visit us again and I am sure the menagerie of alpacas, ponies, pigs etc will have missed you this week. Once again, many thanks indeed. The accommodation was perfect for the family, from stair gate and high chairs, to the 2 sitting areas and games and books. The kitchen had everything we needed and the breakfast pack superb. Hot tub, children's play house and walks with a fairy wood, all with such attention to detail made it fun for all. We had the added bonus of snow and sledges provided. We had a wonderful weekend at the Capercaillie, the accommodation was wonderful and so well thought out to provide excellent facilities to entertain with friend and chill out with family. Everything you could possibly need for a great stay is provided and more. We enjoyed our first evening meal in the BBQ hut it was spotless and had everything we needed to enjoy our pre birthday BBQ and it was so cosy despite the snow covering the ground outside. Then a quick dash to the hot tub to enjoy our first of many dips over the weekend. Again spotlessly clean and so relaxing looking out at the fabulous view across the valley, it was bliss. The bedrooms are all extremely comfortable with soft beds and lovely fluffy duvets we all enjoyed a wonderful sleep. Saturday morning nice and early back in the hot tub to watch the sunrise and then off to enjoy a walk along the footpath with the dogs and meet all the resident animals all looking for treats. Kids would love it here feeding them all and being so close to nature in such idyllic surroundings. Our Birthday meal on Saturday was cooked and served by The Orde Food Company, as recommended by Carol. I cannot praise them highly enough, they were fantastic. Beautiful canopies served with champagne followed by a wonderful meal of our choice cooked to perfection and served with style. What a great team so friendly and professional, you wouldn't even know they had been there everything cleared away and left as they had found it. Another great evening finished off with a glass of champagne in the hot tub, just chillin'. Sunday breakfast, local produce, and lots of it, provided with your accommodation was delicious and so easy to prepare in the lovely kitchen was a tasty conclusion to a wonderful weekend. Martin and Carol have created a little piece of heaven on earth here at Airhouses and we look forward to returning again and again. This is the second Xmas at Capercaillie. We were blown away the first time and the second time we were not disappointed. Fabulous immaculate facilities. Comfortable bedrooms - and great bathrooms. The kitchen contains everything needed for all your self catering needs - right down to martini glasses and an ice grinder! The local area is beautiful and we can recommend Roxburgh Castle near Kelso for a treat. We used the hot tub and the BBQ hut even when it snowed. The owners work 24/7 (it is a working farm) and look after you throughout your stay. Once again a fantastic visit to Airhouses! We have stayed numerous times before in the Lamont lodge and loved every minute. This time we stayed in the bigger Capercaillie lodge as it was to celebrate my husbands 60th birthday with extended family. Wow! Everything from the booking, any special requests we had, through to the lodge itself was 1st class. Feeding the alpacas was another high point. We stayed here for three nights. We now wish that we had booked it for longer as we really didn't want to leave. Carol and Martin have thought of everything inside the property and the surrounding area. An amazing house and location..
Great house, great place & a Llama! The house is fantastic - there are spaces in the house for everyone to do what they like, the hot tub was a hit with the younger generation. We loved eating together on the big dining table, playing board games, breakfast on the decking outside, feeding the animals in the farm and just about everything else about the place. We'll be back I am sure. My friends and I had a wonderful time at Airhouse Lodge's Capercaillie. The lodge was immaqulate and definitely worth a 5 star rating. Our room was open planned and overlooked the fields full of Shetland ponies and the green rolling hills. It's was so relaxing and we thoroughly enjoyed ourselves, especially in the huge jacuzzi. The house is very clean, comfortable and new. The owners where so helpful, advic able and ready to assist, we couldn't ask for more. Location of the house was very good also, it's almost 45 minutes from Edinbrugh city by car. Thank you so much for your review and we are glad you enjoyed your stay at Airhouses. We hope you will visit us again if you return to Scotland. Again, many thanks and it was lovely to meet you all. Our 3rd stay at Airhouses but our first in Capercaillie. It's been our dream to stay in this house and it didn't disappoint, quite the opposite it excelled in every way. Facilities were top notch and thanks Carol for the superb home produced breakfast pack, the haggis especially !!! Hot Tub was superb, massive and well used by all our party. BBQ hut was something else, and worked perfectly. One wee thing to consider was one of our party was wheelchair bound, and although internall wise the house was perfect for him, some form of ramp from the house so he could access the outside hot tub area would have been good. Overall it was a fantastic venue for a special weekend and would recommend to anyone. Thank you so much for taking the time to write a review and we are glad you enjoyed the house. There is something very tranquil about the Capercaillie. You mention a ramp to the outside. There is one to the front door and all 4 patio doors have a level platform from the door which, according to Building Regs, is suitable for wheelchair access. There is one small step from this platform. I assume this step must have been the problem and we now have a small ramp which can be requested during the booking process. Again many thanks for your review and we hope to see you again at Airhouses in the future. Everything was up to the standard we expect from luxury accommodation. Our family and friends were most impressed with our choice of venue. All our requests were catered for especially when a change of linen was required mid week when some of the family went home and our other guests arrived. We are very glad your Golden Wedding Celebrations went so well and that everyone had a good time. Thank you for writing such a lovely review and we hope you will be back again to Airhouses. Many thanks indeed. Super family break for all the family and of course our little dog. Beautiful accommodation boasting a huge hot tub and enclosed outside barbecue no matter the weather. Great location for exploring by foot or car. Carol and Martin were very welcoming and on hand if required. Part of the fun was feeding the variety of animals right on your doorstep. Definitely recommend a visit and we would return again. We are delighted your enjoyed your stay at the Capercaillie and thank you for taking the time to write a review. We do hope to see you all again and many thanks indeed. Having booked The Capercaillie everything looked very good on the website and indeed discussions with the owners was also very pleasant and helpful. When we arrived my expectations were far exceeded as the property looked like it was newly finished, in a beautiful location and with brilliant hosts. There was a welcome pack consisting of eggs, bacon, sausages and haggis all very tasty and lasting us most of the week, the coffee machine was supplied with plenty of pods for everyone and what a BBQ house, fantastic addition. We stayed at the Capercaillie for a long weekend at the end of May. This was a celebration for my Mum's 60th birthday. From the moment we arrived we were blown away by the house, the facilities and especially the welcome pack! The standards in the house are very high and the feeling inside the house is of a perfect modern but relaxing vibe. My wife and I were lucky enough to have the master! The hot tub was the best one we have ever been in! The bbq hut is awesome! The walks round the farm are great and the fact there are also animals that you can feed. Our children had a fantastic time with the animals. I give the Capercaillie 10 out of 10 and would recommend it to everyone! We hope to he returning soon in the not too distant future. Thank you so much for taking the time to write such a great review. We are delighted you enjoyed your stay and do hope you will be back again. Many thanks indeed. We went to Capercaillie with our family including a 2 year old and a 5 month old. The lodge was lovely. It had everything you could want and more. The standard of accommodation was really high and the whole family loved it. The hot tub was a really hit and beautifully clean. Great size for the whole family. The barbecue hut was excellent also, well stocked with charcoal. It was such a successful few days and everyone wants to,return one day. We walked to Oxton one day and then on to The Lodge for a drink. Feeding the animals was a highlight for our 2 year old grand daughter. Thoroughly recommend the lodge. Let's not forget the breakfast basket of Shaws meats! Wonderful! Thank you for your lovely review. We are delighted you enjoyed your stay and we do hope to see you again at Airhouses. Many thanks indeed. The capercaillie house is beautiful and the views are amazing couldn't have asked for anything better for my sisters hen party. She was absolutely over the moon with Airhouses and couldn't believe I had managed to find this hidden treasure. We will definitely be returning to Airhouses in the near future. Thank you an amazing stay. Ps make the most of the hot tub it's well worth the relax. We stayed in this lovely house for four days and could not fault a thing !! Everything has been thought of to make your stay comfortable . We thoroughly enjoyed the hot tub ,even the snow didn't stop us ! So relaxing ! We are already planning when we can all return next year ! Delighted you enjoyed your stay and that the snow in April did not put you off! Thank you so much for your positive review and we hope to see you all again in the future. Many thanks. A Stunning and Special Vacation. Spent a blissful break with family and we all agreed this was the best place any of us have ever been. House and massive hot tub scrupulously clean. Fabulous location in a rural setting yet less than an hour from Edinburgh and the Scottish Borders.Lovely walks, lots of animals to pet and feed. Beds and settees so comfy, huge soaking baths and great showers in en -suite bathrooms. Large table perfect for sitting down to enjoy the contents of the awesome welcome hamper. Fantastic barbecue hut-didn't use this but looks brilliant. Martin and Carol are welcoming and we can't wait to return. Many thanks for taking the time to write such a positive review and we are delighted that you once again enjoyed your stay at Airhouses. We do hope to see you again soon. Never fail to be amazed by Airhouses - have visited a few time, this was our first in the Capercaillie, it was wonderful. Great location, spotlessly clean - Carol& Martin think of everything to make your stay as comfortable as possible. Thank you both. We were away on a girls hen weekend. We had a fantastic time at the house. The facilities and cleanliness of the house was fantastic. The hot tub was great for us as we spent a lot of time relaxing in this in the evenings. Would definitely recommend this to family and friends. The house is wonderful. Thank you so much for taking the time to write such a positive review. We are so glad you enjoyed your weekend and do hope you will visit Airhouses again. Found Airhouse to be a little gem in the Scottish Boarders, all family members from three generations loved their stay and would gladly recommend it, and all are hoping to come back soon. Everything about our stay was fabulous! The house is amazing, extremely spacious and well equiped. Extra touches like slippers & gown were great! The kitchen had absolutely everything. The hot tub was fab as was the BBQ hut. We loved being able to feed the ponies, alpacas, pigs and llama! Location was good, half hour drive to Edinburgh. Carfraemill was great for family dinner - only couple of minutes drive. Overall a great stay and we'll be back! *Carol was very accommodating in helping us with our booking & Martin was very helpful in taking the time to come over the explain how the hot tub worked when we arrived late due to traffic. *The breakfast pack was a really nice gesture that we made good use of. *We loved that we had total seclusion yet only a one and a half hour drive from Glasgow & we felt completely left alone which is what we wanted from our break. *We were really impressed by the house itself, particularly the well equipped kitchen which my husband (a chef) was in his element in & the hot tub. Having a small smart car is the only reason we have not given a five for location as I was quite nervous on the drive from Oxton to the farm which was quite rough in parts, however I'm sure a larger car would have no problem. We would really love to return & have already recommended The Capercaillie to our friends. Thank you so much for your lovely review and we are delighted that you enjoyed your stay at the Capercaillie. Glad to hear to kitchen was enjoyed and the breakfast basket. The ingredients are all local and the meat from the butcher in Lauder. The Council road from Oxton has now had the grass verges trimmed which makes it easier to see, and it feels wider, which may have helped you. However, please do mention any problem if you visit Airhouses again as we would have been more than happy to collect you from the village. Once again, many thanks for taking the time to write a review and we hope to welcome you back sometime in the future. The Capercaillie certainly has the WOW factor. Spotlessly clean, stylish furnishings and so well equipped. The views are wonderful with ever changing light and it is a great place for walks and wildlife spotting. The tranquilty of Airhouses makes it a lovely place to return to after a trip to Edinburgh or the coast, all of which are easy to get to. During our eleven night stay the property was serviced twice which we were very impressed with and the breakfast hamper on arrival is excellent. We have no hesitation in recommending Airhouses, it is mosr definitely a place we will return to. Thank you for your review and we are glad you enjoyed your stay. We would respectfully point out that it was the second time you have been advised that music could be heard outside. All the doors were wide open and the music was incredibly loud. We closed all the patio doors as we were unable to turn the music down as it was coming from your own equipment. We could also not make ourselves heard by any of you. No one was getting changed, 8 of you were in or around the hot tub and two were in the living room. Eventually someone from outside came to see us and we explained the position yet again about music being heard outside. The music was so loud that it could be heard in the village, which is over 2 miles away. Our web site is very clear about music outside being unacceptable at any time. This is out of consideration for other guests and our abundant wildlife. We try to provide everyone with a relaxing and peaceful holiday. However we are delighted that you enjoyed the house, the hot tub and the BBQ hut. A beautiful house, didn't get chance to use the hot-tub but had a lovely evening in the BBQ house. Comments were made re paying for extra toilet rolls if needed, also penalty charges if leaving late on the departure day which we felt was very early. I think some of the party felt there were a lot of unnecessary rules. Thank you so much for taking the time to write a positive review. We are glad you enjoyed the beautiful Capercaillie. The BBQ hut is a fairly new addition and very popular. I understand that 9.30 can seem a little early for checking out but unlike a hotel, we have the whole house to clean not just one bedroom. To have everything ready, including the hot tub and the BBQ hut, by check in at 4.00 pm we need that amount of time plus 6 staff. Even just a half hour delay in checking out can cause problems. However, depending on the day of check out there is an option to enjoy a later check out time. Once again many thanks and we hope to welcome you to Airhouses again at some time in the future. A great 5 night break in wonderful surrounding. 8 of us thoroughly enjoyed our stay in Capercaillie. The house and grounds were immaculate, the views spectacular and the animals engaging. A visit to the local pub where we were made very welcome and even given a list home by one of the locals simply added to our enjoyment. It was lovely to meet you all and we are glad you enjoyed your stay at the beautiful Capercaillie. We hope you will visit us again at some time in the future and again, thank you. Our stay here was lovely! The house is fabulous, the photo's on the website really don't do it justice. The living space and kitchen was big and fitted the 8 of us nicely. The bedrooms were all lovely too, and the beds were very comfortable! The bathroom had a high finish too. The highlight was the BBQ hut and the amazing hot tub! Thank you having us to stay. Will definitely be back. This was our second visit and lived up to every expectation - an amazing setting and fantastically comfortable house that accomodated our every need. BBQ hut was a new addition which we loved. we will be back FOR SURE. What a stunning house with everything you could ever think of needing. We used the hot tub and BBQ hut during our stay. Celebrated my 40th birthday early with 9 friends here recently and we will all be back. From the ease of booking, to the regular email updates from Carol & Martin, to our fabulous weekend stay in a fantastically well equipped home SUPERB! Thank you so much for your positive review which is greatly appreciated. We do hope you will be back at some time. Again, many thanks indeed. Lovely house had everything we required which made our stay a great experience.All furnishings of high standard.Very tranquil setting and calming with the animals roaming around. Thank you so much for your positive review. We are glad you enjoyed your stay and do hope you will all be back to Airhouses again at some time in the future. Again, many thanks indeed. We were absolutely amazed by how beautiful the lodge and surrounding area were. The facilities at the lodge were fabulous. It is within walking distance of oxton and the local pub, which was very welcoming. We really had the most wonderful weekend, and we were so sad to leave. Thank you so much for your lovely review and we are so glad you enjoyed your stay. It would be lovely to see you all again at Airhouses. Again, many thanks. Eight adults and two children stayed in the house, wanted everyone together for this occasion, my son also celebrated a birthday while we were there. The house was ideal for this more than enough room for us all. Hot tub and BBQ hut were excellent. Would love a return visit. Found the 9.30 check-out time rather early no time for a leisurely breakfast on our last morning. We are so glad you enjoyed the Capercaillie and do hope you will return. The BBQ hut is proving very popular at all times of the year. We are looking at ways round the check out time but it is such a huge house to clean to in the short time between changeovers. Any suggestions would be appreciated. Many thanks for taking the time to give such a positive review. The capercaillie was perfect for a hen weekend. The house was stunning and very comfortable with everything you needed. Bedrooms were lovely and the hot tub was fab. Stunning views too. Thank you so much for taking the time to give such a positive review. The Capercaillie is very popular for "girlie" weekends and we are now working with various companies, such as beauticians, therapists, boot camp specialists, etc. so that we can offer even more. We hope to see you all again at Airhouses at some time in the future. This is our fourth visit to Airhouses, our first to the Capercaillie. It is an extremely comfortable house to stay in, just a pity that it was too cold for the hot tub! Martin and Carol have ensured that everything has been thought of to make your stay as happy and comfortable as possible. There is lots to do in the surrounding area but it is also nice just to chill out! We stayed in The Ramsay on our last visits and the comfort and attention to detail was the same there. It was lovely to see you again at Airhouses and we are delighted that you enjoyed the Capercaillie. Many thanks for taking the time to write such a positive review and we hope to see you again at Airhouses.